Looking for a challenging but rewarding Karma run? 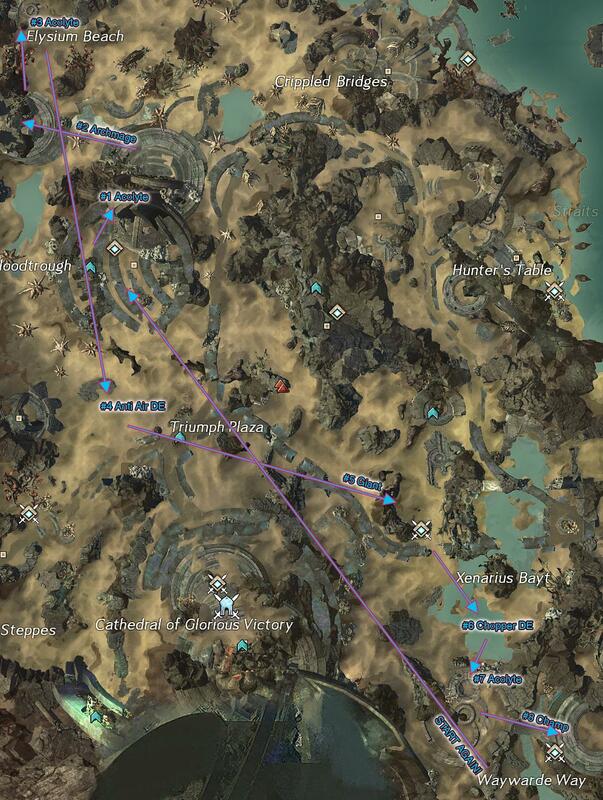 Here's a sample farming route in the Straits of Devastation, a level 70-75 zone, which can be done with a group of friends or guild mates. It would be advisable to do this with at least five members to ten members to ensure that fights finish quick and with as little deaths as possible. The bosses in this farming run are not pushovers, and can wipe careless teams. Also, consider using Karma boosters before the run starts to amplify your Karma gains. Skipping some of the harder bosses can also be an option, especially when the group is less than the ideal number for the challenge. Even if a boss offers a relatively higher Karma reward, if it takes a disproportionate amount of time to down, then it would be better to move to the next step of the farming run rather than waste any more time. Each completed event will reward between 260 to 350 base Karma before any boosts, which totals to around 2300 to 3150 Karma for one run. The farming run starts at The Bloodtrough, which is at the upper-west side of the zone map, with the task of killing the veteran Risen Acolyte of Grenth. Move a bit northwest to Elysium Beach to participate in the event to help Agent Raia fight against a Champion Risen Archmage. Be prepared for the follow-up quest against a Veteran Rise Plaguebearer immediately after. Move further north of the Elysium Beach to battle a Veteran Risen Acolyte of Lyssa. Backtrack south to Triumph Plaza to protect the Pact choppers from Risen anti-air cannons. Travel eastward across Triumph Plaza to the northwest of Xenarius Bayt(near the waypoint) to duel against the Risen giant that roams around the area. Head southwest and into the Xenarius Bayt to participate in the Chopper dynamic event, which involves protecting Agent Kurzz while he repairs his downed helicopter. Then just a short swim south there is a beach landing to eliminate another threat, a Veteran Risen Acolyte of Melandru. The final pit stop is the grueling finale fight can be found a little to the east, in a ring-like arena area where a Champion Risen awaits. Head back to Step 1 to rinse and repeat. Here are the 8 steps to farm Guild Wars 2 Karma in Straits of Devastation. Click here to see gw2 karma price in the market.